Elizabeth Reid Boyd Archives - Joelle Delbourgo Associates, Inc.
Elizabeth Reid Boyd: Reid Boyd has degrees in psychology and gender studies. She has taught interpersonal, communication, and personal development skills including meditation, self-awareness, self-care, and mindfulness at the university level for almost two decades. Jessica Moncrieff-Boyd: Moncrieff-Boyd completed her undergraduate degree at the University of Melbourne. She has received training in several therapeutic disciplines, including mindfulness-based cognitive behavioral therapy. She has experience working with women and adolescents experiencing body image problems. The first beauty book to apply mindfulness to daily beauty regimens, proving that the mind is the most powerful beauty tool we have, by an Australian mother/daughter team, both experts in body image. (World Rights, Skyhorse Publishing, Spring 2017). Eliza Redgold is a natural pen-name based upon the old, Gaelic meaning of her name, Elizabeth Reid Boyd. English folklore has it that if you help a fairy, you will be rewarded with red gold. She writes fiction as Eliza Redgold and non-fiction as Dr Elizabeth Reid Boyd. Eliza Redgold’s historical women’s fiction includes her Ladies of Legend trilogy, starting with NAKED: A Novel of Lady Godiva released by St Martin’s Press, New York. Her ‘Romance your Senses’ series of contemporary romances are published by Harlequin (MIRA) Australia and her Victorian historical romances are published internationally by Harlequin Historical (Harper Collins) London. They have been translated into three languages, including Italian, the language of love. Dr Elizabeth Reid Boyd is an academic in the area of gender studies, based in the School of Arts and Humanities at Edith Cowan University in Western Australia. She is committed to the empowerment of women in body, mind and spirit. She teaches personal development and co-authored the acclaimed Body Talk: A Power Guide for Girls (Hachette Livre). She has contributed to a range of academic journals and mainstream media ranging from Women and Language journal and The Encyclopaedia of Romance to Cosmopolitan magazine, and has written about her experiences as a ‘romantic academic’ in The Guardian. 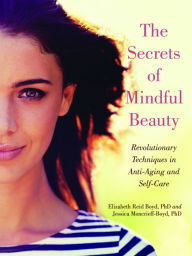 Her latest non-fiction book out now from Skyhorse Publishing New York is The Secrets of Mindful Beauty with her daughter Jessica Moncrieff-Boyd. An international bestseller on Amazon, Kobo and iTunes, it shares revolutionary techniques in anti-aging and self-care that will change how you look and how you feel, by applying the beautiful practices of mindfulness.